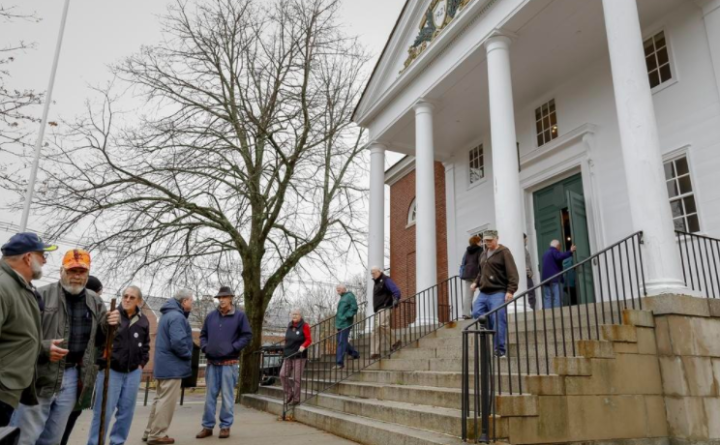 Kennebunk voters come and go from their polling place at town hall Tuesday. Voter turnout was high in Kennebunk Tuesday, where voters passed all three local referendum questions, including appropriating $100,000 toward the conservation of Hope Cemetery & Woods, a 72-acre parcel of woods and trails near downtown. The article passed with 4,329 voters in favor and 2,182 voting against. The funds will help the Friends of Hope Cemetery & Woods and the Kennebunk Land Trust to work in partnership to raise $1.4 million through public and private funds to save the property from possible development and preserve the trails for public use. The $100,000 will come from the town’s unassigned general fund balance. The town’s Budget Board recommended approval of the cemetery funding leading into Election Day, while the Board of Selectmen opposed it. Question 1 asked voters to appropriate $75,000 from the general unassigned fund balance to purchase two police vehicles. Voters narrowly supported appropriating these funds by a 3,414 to 3,076 margin. The Board of Selectmen voted 7-0 to recommend this article, while the budget committee was opposed by a 1-5 margin because they felt that the school district should fund the vehicle needed for the new school resource officer. The vote was close because some residents agreed with the Budget Board, according to Town Clerk Merton Brown. Clarification to the zoning ordinance around piers, docks, bridges and marinas is being addressed in Question 3 on the ballot, which passed by more than a two to one margin. A total of 4,205 voters supported the question, while 1,974 voted against it. Polls opened at 6 a.m. at Town Hall and Town Clerk Merton Brown said turnout in the first two hours the polls were open was much higher than normal. “The highest number we’ve ever had between 6 and 8 was 208, and this morning we had 603 voters,” Brown said. The number of new voter registrations was high, too. Brown had a big stack of new voter registration cards as of 4 p.m. with more people lined up to register before casting their ballots. “It’s very encouraging and hopeful,” he said.